Two teams of students representing the Yeshivah of Flatbsuh recently won highest honors in this years WordWright Challenge, a national competition for high school students requiring close reading analysis of many different kinds of prose and poetry Participating with 582 school teams from all across the country, the school’s ninth graders tied for fourth place in the nation in the year’s third meet, held in February At the same time, the school’s twelfth graders tied for third place in the nation. Students at the school who achieved outstanding results in the meet included freshman Leah Linfield and Dylan Sutton, who were both among the ten ninth graders in the entire country who earned perfect scores, and seniors Jacob Lazaros and Rickie Zeitoune, who were among the 15 twelfth graders nationwide to do the same. Freshman Sylvia Franco, sophmores Eddie Farhi and Louis Franco, junior Michael Srour , and seniors Shelley Raizin, Michelle Sabbagh, and Izzy Shamah all earned near-perfect scores, while freshman Caryn Darmon, Rachel Nussbaum, and Alex Volchek all earned honorable mention. More than 58,000 students from across the country (and from three foreign nations) participated in the meet. The students were supervised by Shifra Hanon. The premise behind the WordWright Challenge is that attentive reading and sensitivity to language are among the most important skills students acquire in school. The texts students must analyze for the challenge can range from short fiction by Eudora Welty or John Steinbeck to poetry as old as Shakespeare’s or as recent as Margaret Atwood’s, and to essays as classic as E. B. White's and as current as a Time opinion piece by James Poniewozik. Though the texts vary widely in voice, subject, tone, and length, they have one thing in common: style. All use language skillfully to convey layers and shades of meaning not always apparent to students on a first or casual reading. Like the questions on the verbal SAT I, the SAT II in English Literature, and the Advanced Placements exams in both English language and English literature, the questions posed by the WordWright Challenge ask students both to recognize the emotional and/or rational logic of a piece of writing and to notice the ways in which a writer’s style shapes and shades his meaning. Because the WordWright Challenge is a classroom activity and not a college-entrance exam, however, it can be a learning experience not just a high hurdle. After completing a Challenge, classes are encouraged to talk about the texts and the answers to the multiple-choice questions, and are also given additional topics for open-ended discussion and/or written response. Last Wednesday morning, our Seniors participated in an intense scavenger hunt in and around Grand Central Station. Armed with digital cameras, students raced around the area to uncover a list of clues that were both fun and educational. 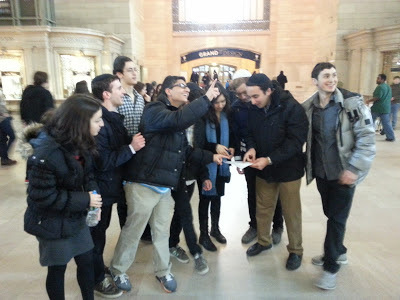 Aside from the bonding and fun, the students became acquainted with this important NYC landmark. The event was planned and coordinated by Senior Council, led by Kim Hamadani, Frieda Shalam, Nathaniel Evelkin, and Jackie Oved. 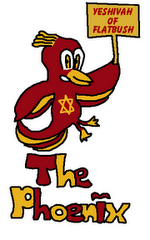 Although Yeshivah of Flatbush has always had a Senior play, Hebrew play, Yachad play, and Yom Hashoah performance. This year we added a wonderful addition to enhance the theatrical creativity called Drama Troupe. 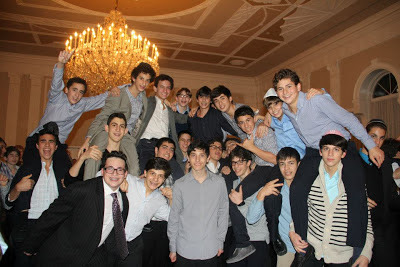 This group would perform for the student and faculty, five plays throughout the year in order to enhance the Yeshivah as a whole and instill the classic ideology of the, "renaissance man;" not only excelling in maths and sciences but also participating in creative ways and enhancing the entire Flatbush body as a whole. Recently two plays were performed over six times for each grade! The impacts were unimaginable and the feeling of accomplishment by the actors couldn't be put in words. Being a part of such a show and knowing that you had an impact on all of those who watched you really brings to life the feeling of how you can impact your surroundings. After the show when you're standing on the stage and everyone is clapping, you're not only proud of yourself but proud of your friends and the realization that you're part of something greater than yourself. I, as an actress and a vital part of the Drama Troupe, can continue my high school career knowing that I impacted my school and left my mark in a positive way, benefitting my school: Yeshivah of Flatbush. Our world is constantly advancing. And yet, the most important advancement of all is one that is often overlooked: the progress of our own selves. We are not simply bystanders in a world of growth and change; we have a responsibility to be a part of this progress. It is our obligation and our privilege to improve ourselves, to constantly strive to be just a little bit better than we were yesterday. After all, how can we know what our best is if we stop trying? If we give up on ourselves, how will we ever know how much we can truly accomplish? Focusing on improving ourselves is the only way to maximize our own potential and our own impact. Therefore, Judaism not only places great importance on this concept, but it also provides a framework through which we should attempt to achieve our own self-growth. 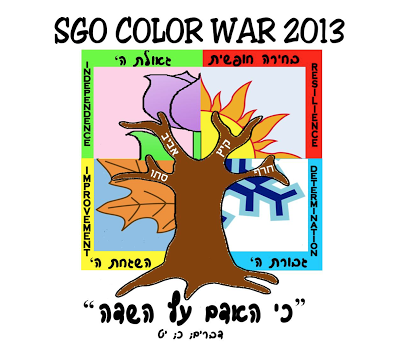 This framework is based upon an important concept that is established by the pasuk, "כי האדם עץ השדה.” Man grows through the same process as the tree, starting out as a small, almost inconsequential seed and growing gradually into an incredible force of nature. Growth does not happen in an instant. As they grow, trees use the seasons as their landmarks of time and of progress, and as human beings, so do we. Our Jewish tradition provides us with important guideposts: the holidays. These markings of time lead us on our path of improvement and guide our development through every step. On Tuesday March 12th, Alef Nisan, we had a special Rosh Chodesh program. We had a kumzitz in the gym with special guests all the way from Israel, The Hazamir Israel choir. During the kumzitz, led by Rabbi Besser, we sang songs like Acheinu, V’HiSheumda, and Esa Eynai. You could feel the spirituality and Achdut in the room, and you could tell that our guests felt it too. At the end of the Kumzitz, Hazamir Israel preformed a few spectacular songs for us. Then the Flatbush choir joined Hazamir to sing together a song called Le’eyla, and then the Flatbush choir preformed Rau Vanim. The kumzitz finished with the singing of Hatikva. בשבוע האחרון של חודש אדר קיימנו את ״שבוע העברית״, בו אנו מדגישים בקרב תלמידינו את חשיבות הדיבור והכתיבה בעברית. ההודעות ברמקול נעשו בעברית; המנהל, הרב לוי, דיבר בעברית אל כל התלמידים; כמה מן המורים הכלליים (מתמטיקה, ביולוגיה, היסטוריה כללית, התעמלות ועוד) לימדו חלק מן השעורים בעברית, וכמובן שהדגשנו את הדיבור בעברית בלימודי הקודש (מה שמשתדלים לעשות במשך כל השנה). * תלמידי כתות ט׳ יצרו תצוגות, שעסקו באנשים חשובים או אנשים מפורסמים בישראל בעבר ובהווה. * תלמידי כתות י׳ הכינו תצוגות על מקומות בישראל. 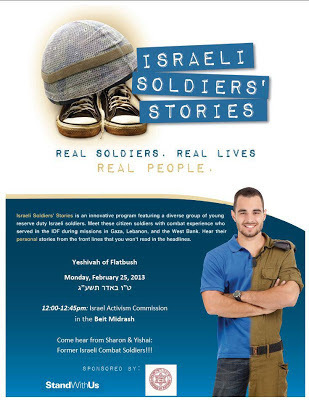 * התצוגות של תלמידי כתות י״א היו סביב הנושא ״איך עושים״. תלמידים כתבו על מעשי חסד או על תפילה בכוונה. אחרים הסבירו איך להכין אוכל בריא או מאכלים ישראלים ואתניים (חומוס, פלאפל, סמבוסק, ועוד) או עוגות וגלידות. 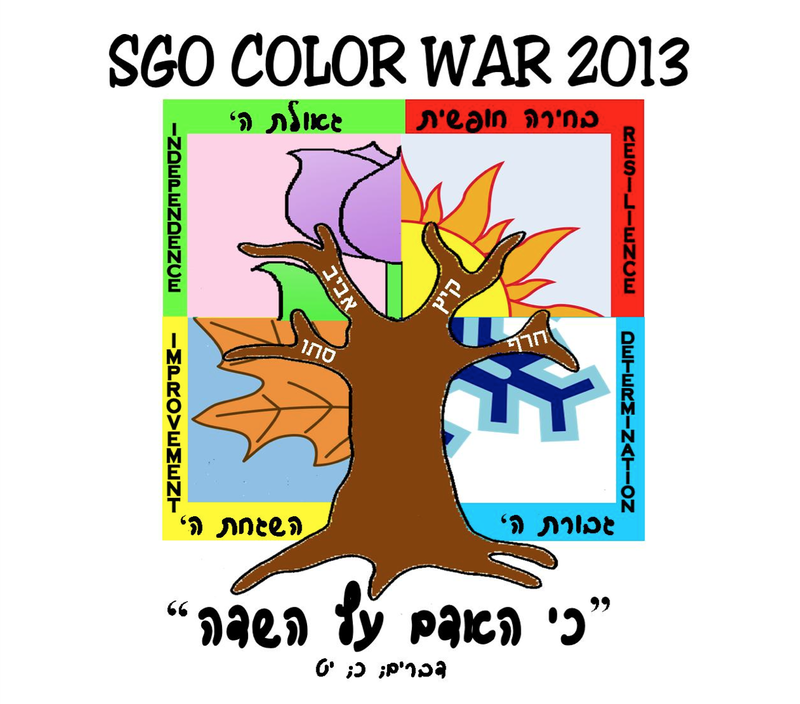 אחרים כתבו על ״איך לרדת במשקל״. ״שבוע העברית״ הוא מסורת בבית-ספרנו. את התכנית יוזם ומרכז מר רפאלי, בעזרת המחלקה לעברית בראשותה של הגברת ציפורה הלפר ומורים ותלמידים רבים. “All the world’s a stage,” William Shakespeare wrote in his comedy As You Like It, and several Flatbush classes recently got to see firsthand what he meant. Seniors, juniors, and select sophomores were treated to a production of the play at the New Victory Theater in Manhattan on Thursday, February 28, and Wednesday, March 5. In the days before the trip, actors from the theater visited classes at Flatbush to run fun, interactive workshops about the play. It was the first trip to the theater for some students, but for everyone it was a chance to see Shakespeare’s writing come off the pages of their books and spring to life on stage. After the play most of the conversation was about the interesting forest creatures that helped transition from scene to scene. The play focuses on a heroine, Rosalind, who escapes an evil Duke by disguising herself as a man and hiding out in the forest. There she runs into her love, Orlando, who himself is hiding out from the Duke and from his own brother. The play ends with Rosalind and Orlando getting married, along with three other couples that meet up along the way. 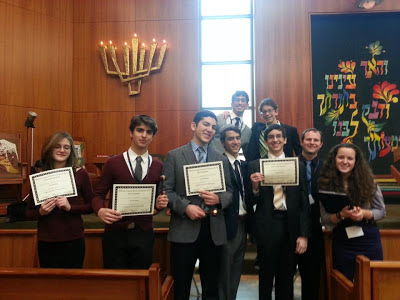 On March 13, 2013 members of Yeshivah of Flatbush High School Model Congress (YOFMC) brought home four state-wide awards from Yeshiva League Model Congress in The Five Towns. This year, YOFMC, an extracurricular “team” all had the chance to travel to the five towns and compete in Model Congress programs overwhelmingly populated by private school teams. The hours, days, weeks, and months of dedication it takes to get to that point all add up to "The Model Congress Experience." For over 10 years, YOFMC has been largely led by its student captains. The 2013 YOFMC presidents are Senior Captain, Ariel Aiash and Junior Captain, Charles Chakkalo. This was an amazing group, they were competitive, competent, and cohesive-excellent leaders. They carry on a legacy of excellence established by past leaders who've mentored them. This year, over half of the YOFMC Team received awards. Honorable Mention Awards going to: Andrew Hersh 3HR and Shterney Isseroff 4T. Best Delegates went to both the Senior and Junior captains, Ariel Aiash and Charles Chakkalo. 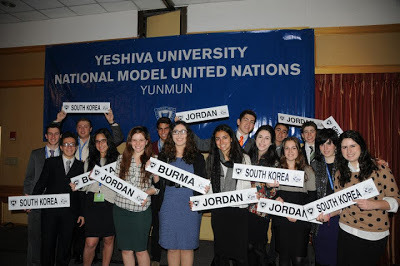 The overwhelming success of the YOFMC took place under the leadership of our coach Mr. Brian Katz. 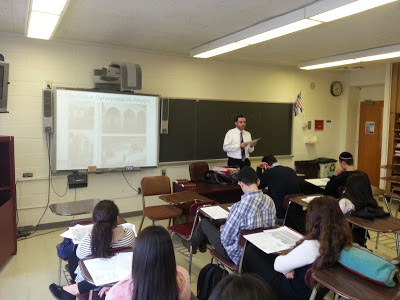 Through the YOFMC students learn about America's system of government, while also experiencing the culture of top-notch Yeshivas and developing confidence, public speaking talents, and other skills. Over the last few weeks, seniors in The Sephardic History elective class were privileged to hear from visiting guest lecturers on a variety of topics related to the history of Syrian Jewry. Rabbi Dr. Abadie of the Edmond Safra synagogue led us on a whirlwind tour of the history of Syrian Jewry from its origins to the current day. He included a fascinating discussion of names and what they tell us about the origin of families in the 'SY' community as well as a discussion of some of the unique customs in the community. 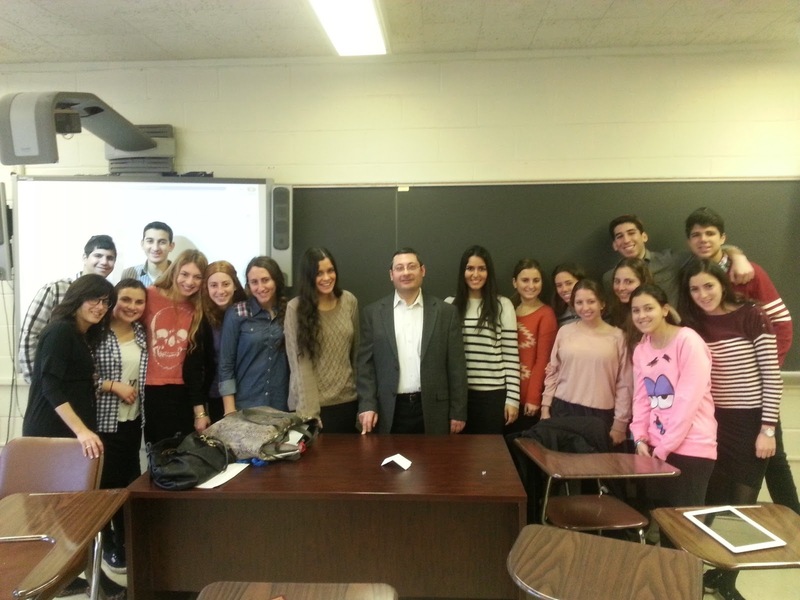 Professor, Rabbi Dr. Ricky Hidary lectured on 'the history and mystery of the Aleppo codex.' In a dynamic and fast-moving powerpoint presentation, Professor Hidary demonstrated why the Codex is so important and discussed the enduring mystery behind the missing pages of the Codex. Mr. Jack Bassoul, a member of Bnei Yitzchak who immigrated from Syria in 1992, shared his personal story with us and vividly described Jewish life in Aleppo under the brutal Assad regime. 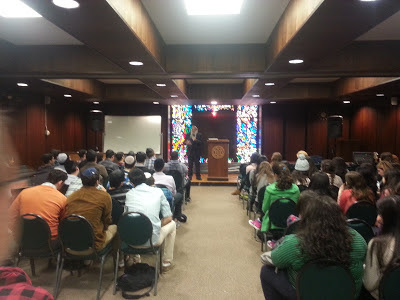 He talked about his schooling, religious life, persecutions, and interactions with non-Jewish neighbors. Mr. Victor Esses will join us for a musical presentation. He will play traditional Sephardic instruments and discuss the middle eastern sephardic musical tradition. All of the junior classes recently visited the fascinating and funky Living Torah museum. The museum has an amazing variety of artifacts from the ancient period and because the museum has a hands-on policy, students were able to touch, feel, and even try on items that were thousands of years old. Students enjoyed handling ancient coins and Roman weaponry, trying on magnificent jewelry worn by Egyptian queens, and demonstrating their strength (or lack thereof!) in a contest involving a large stone used in ancient battles. Some of the outstanding artifacts we saw included the world's oldest menorah and a Samaritan tablet with the Ten Commandments inscribed on it. The visit to the museum really made ancient Jewish history come alive in a way that no textbook can. It also demonstrated the significance of archaeology in helping us better understand the ancient world. Last Thursday night, 40 seniors to a trip to a Devils hockey game as part of a Senior Night-Trip organized by Senior Council. Even though the Devils lost, everyone had a great time and enjoyed the game. It was a great night to spend time with and bond with classmates from the senior grade. Last week students took part in the first meeting of a new program called Partners in Reading. The high school librarians, Rachail Kurtz and Brian Katz, together with Lynne Grant, elementary school librarian organized a high school and middle school book club, where 11 high school students led lively and interactive book talks with over 30 middle schoolers on the book, The Wednesday Wars. After each member of the group introduced him/herself over a pizza lunch, they settled into smaller groups to begin dynamic literary discussions. The students explored the themes and historical perspective of the book with their high school mentors. Everyone enthusiastically agreed to return for a second book talk in April. A few students from Ms. Robinson's Tzei U'lemad class ran a 5k last Sunday in Prospect Park in the effort to raise awareness for mental and physical health. Senior Sally Saban, and Juniors Francine Shamosh, Marielle Salem, and Nina Esses ran on behalf of Yeshivah of Flatbush and each raised over 200 dollars to donate to both Ohel and Gift of Life charity organizations. Last week, students of Rabbi Lubner's AP Biology class embarked on a trip to a science lab to perform Gel Electrophoresis. The lab experience, which consisted of utilizing and analyzing DNA, was a learning experience on both an academic level as well as a experiential level. Students were able to partake in real experiments which allowed them to see and get used to what really takes place in the field of genetics. Last Semester: A New Beginning? On Tuesday, February 12, 2013/ 3 Adar 5773, the High School Guidance Department and Parents’ Choices Commission held an event for Parents of Sophomores at the JBHS. The program, entitled “It’s Not My Kid: The Dangers All Teens Face with Drugs and Alcohol” opened the parents eyes to the challenges and choices that teens face in today’s world. The Parent program included an insightful video by students on the Choices Commission, as well as a thought provoking presentation by parents who shared their personal story of their son’s battle with drug addiction. Their willingness to speak about this difficult and painful time in their lives made a deep impression on everyone who attended. Tips were shared for ways that parents can effectively help their teens stay safe and make responsible decisions. This program was held a week after Sophomore Seminar where the students had a special program with the JACS organization. Adults in recovery from substance use shared their stories with them and empowered the students to make good and safe choices in complicated social situations. The next Parent Workshop will take place March 11, 2013/29Adar 5773: Navigating Teen Relationships and Reputations” Two sections 10:00AM; 7:30PM. To RSVP please contact: 718-377-1100 x190 or email parentchoiceshs@soin.flatbush.org. Being raised in a completely Zionist society is a wonderful experience, however at times it could work against us. Let me explain: We sort of live in a “bubble”, a bubble of Zionist Jews that agree with the State of Israel’s existence and want to see it prosper. However, that is not the case in college campuses across the country and it is surely not the case in the world media. College campuses and the world media love to isolate Israel and make Israel look like the bad guy, no matter what situation occurs. If you looked at the headlines during the IDF’s recent Operation, which was known as “Operation Pillar of Defense”, many newspapers had pictures of IDF soldiers controlling the missile defense system known as the “Iron Dome”, but the headline wasn’t “Israeli soldiers defending Israel against rockets from Gaza”, but rather, “Israel launches rockets into Gaza”. This was absolutely unbelievable, the world media did not show the terrorists firing rockets at Israel, but rather chose only to show Israel defending itself. If you head to a college campus, you’ll notice that it is very hostile towards Israel as well.